On 20th June this year, Ghoncheh Ghavami had gone along to watch Iran's national volleyball team play against the Italian side. In any normal country, this would have been a joyous event, but in Iran for Ghoncheh and other women it carried a risk. Women are not allowed to enter sports stadiums in Iran and watch men play sports like football or volleyball. 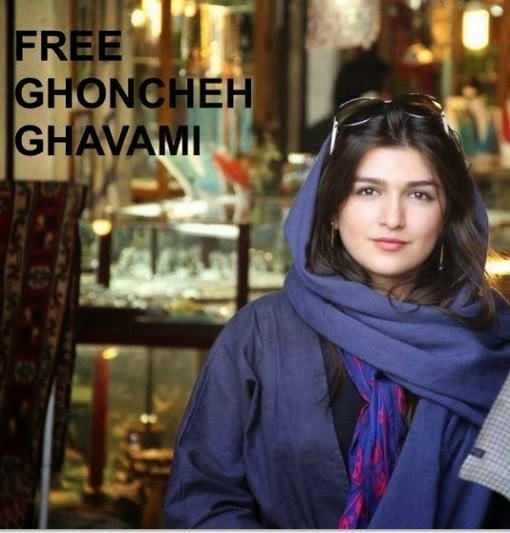 Ghoncheh and some other women, who had seen this as an opportunity to protest against this discrimination against Iranian women, were arrested. They were later released on the same day after signing a pledge not to engage in such actions again. Their personal belongings however were kept by the security forces for further examination. Ten days later, Ghonche went to collect her personal belongings but was arrested again. Security agents then searched her house and collected more of her belongings. Ghoncheh was transferred to the notorious Evin prison and spent 41 days in solitary confinement. Although her interrogation is reportedly now finished, they have extended her detention by another 2 months. Her family until now had decided not to publicise her arrest, thinking that it would further harm her case and she would be released after a brief period. Since yesterday however, the opposition site Kalameh, published her arrest and continuous detention. I knew Ghoncheh from London. She had dual British-Iranian citizenship. Ghoncheh in Persian means bud and she had lips that immediately reminded you of a red rose bud. She told me once, when she was born, as soon as her father saw her lips, he decided he could only call her Ghoncheh. As attractive as she was, Ghoncheh was extremely and frustratingly naive when it came to Iran politics. I remember having endless arguments with her about the new administration in Iran. Ghoncheh was delighted with the election of Rouhani, as the new president of Iran. She was convinced that Rouhani was the right man to set the catastrophes of the past 8 years right and lead Iran into the future. My continuous advice to her that this was just a window dressing for the outside world and inside Iran, it will be business as usual, did not resonate with her. 3- They all continue to blame their rivals are putting the spanners in the wheels and preventing them from setting things right. And so they keep on stringing along the new generation of voters. But again, sharing my experience with this young naive 25 year old was to no avail. She decided not to listen to my advice and to go back to Iran, thinking she can better support Rouhani's government from inside Iran. I was last due to see Ghoncheh on the opening night of the movie, King of Sands, made by the Syrian director, Najdat Anzour. I had two extra tickets for Ghonche and her friend but they could not make it and I never saw her again. I was not aware she had gone back to Iran and did not know she was a prisoner until yesterday. I could say she was a victim of her own naivety but I could also say that at least, unlike many other Iranian asylum seekers who are promoting the Iranian regime while being paid benefits by the UK government, she went back to help the person she believed was the right man to save Iran. It will be a painful lesson for her, but perhaps her plight will open some other eyes. It is understood that you must tow the line while trying to post "the truth". Be very careful, bro. Great work on this post! I also have a quick question about your blog, is there an email address that I can reach you at? If Iranians themselves are so naive or ignorant, how can we expect to convince the rest of the world?